Years of experience by the California fire service have led to a new strategy for reducing the chance of building loss or damage due to wildfire, with new regulations that are now mandatory within the Wildland Urban Interface (WUI). It is a two-pronged approach – providing defensible space and constructing a more ignition-resistant structure. Buildings are now required to be constructed so that they have less chance of catching fire from burning embers from wildfires. Most of the highest wildfire losses take place during hot, windy days or nights when flames spread so fast that many buildings catch fire and overwhelm available firefighting forces. Many buildings ignite when burning embers land on wood roofs, blow in through vents, pile up in cracks, or become lodged under boards. By constructing buildings in a way that reduces the ability of embers to intrude, a major cause of structure ignition is reduced. Recently adopted building codes reduce the risk of burning embers igniting buildings. Standards are already in effect for roofs, attic vents, siding, exterior doors, decking, windows, eaves, wall vents and enclosed overhanging decks. The law requires that homeowners do fuel modification to 100 feet (or the property line) around their buildings to create a defensible space for firefighters and to protect their homes from wildfires. The Office of the State Fire Marshal's (SFM) Building Materials Listing Program (BML) was originally created to mandate that all fire alarm systems and fire alarm devices be approved and listed by the State Fire Marshal prior to sale or marketing within the state. The program later was expanded to include many other materials such as: roof coverings, fire resistive wall and ceiling-floor assemblies, wall finish materials, fire and non-fire related hardware, insulating products, fire doors, fire dampers, electrical appliances and devices. Each product approval and listing is based upon an evaluation of test results that include an analysis of required product performance and reliability features. All manufacturers that want to list products in California must have those products tested and labeled by a SFM accredited laboratory. If a product does not qualify for listing but meets the standard of the “Materials and Construction Methods for Exterior Wildfire Exposure,” Chapter 7A of the California Building Code will be listed in the WUI Product Handbook. The new building standard for the Fire Hazard Severity Zones will be enforced by the Building Official as projects go through the plan checking process. To best assist them in determining if a product meets the code requirements, the State Fire Marshal's BML Program is accepting applications for materials that meet the new code. These materials will be listed on the SFM BML website and the Wildland Urban Interface Building Codes page of the Wildland Hazards and Building Codes website section. The SFM listing service provides building authorities, architectural and engineering communities, contractors, and the fire service with a reliable and readily available source of information. Since the materials under Wildland Urban Interface Building Codes (except wood shakes and shingles) are not required by law to be listed by the SFM, the listing for these products are strictly voluntary. Materials not listed by the SFM may still qualify for use provided they met all the requirements under Chapter 7A. If not listed on the SFM site, all documentation and testing certificates showing compliance must be submitted to the building official having jurisdiction for final approval. On September 20, 2007 the Building Standards Commission approved the Office of the State Fire Marshal’s emergency regulations amending the California Code of Regulations (CCR), Title 24, Part 2, known as the 2007 California Building Code (CBC). “701A.3.2 New Buildings Located in Any Fire Hazard Severity Zone. 2. Local Agency Very-High Fire Hazard Severity Zone. New buildings located in any Local Agency Very-High Fire Hazard Severity Zone for which an application for a building permit is submitted on or after July 1, 2008, shall comply with all sections of this chapter. 3. Wildland-Urban Interface Fire Area designated by the enforcing agency. New buildings located in any Wildland-Urban Interface Fire Area designated by the enforcing agency for which an application for a building permit is submitted on or after January 1, 2008, shall comply with all sections of this chapter. Information Bulletins” and formal state building standards “Code Interpretations” pertaining to wildfire protection building codes are available from the Office of the State Fire Marshal. Project specific questions should be addressed by the agency having jurisdiction of the project. They may have more restrictive requirements in local ordinances. New Building Standards have been adopted for areas within local jurisdiction Very High Fire Hazard Severity Zones and in the State Responsibility Areas (SRA). Phase I of the standards are already in effect. Phase II standards will go into effect January 1, 2008. A wildfire-safe home must be an ember-ignition-resistant home, so that even if the flames do not reach your home, it will be able to withstand exposure to embers that may have been blown a mile or more in front of a wildfire. To provide maximum wildfire protection for your home, a combination of near-home vegetation management, appropriate building materials, and related design features must be used. These points are summarized the excellent Univesity of California publication, "Home Survival in Wildfire-Prone Areas: Building Materials and Design Considerations." Preparing and maintaining adequate defensible space will guard against flame contact and radiant exposures from nearby vegetation—but because of the likely ember exposure to your home during a wildfire, you cannot ignore building material and design considerations. Similarly, if you ignore your defensible space (i.e., you do not have it or do not maintain it), the wildfire will produce maximum ember, flame, and radiant exposures to your home. It is very unlikely that even hardened buildings can survive such exposure, as a weak link will likely exist somewhere in the building enclosure. There is a direct link between home survival, the vegetation management required in developing adequate defensible space around the home, and the building materials and design used to construct the home. The area where your vegetation should be managed (i.e., your defensible space) will depend on the particular topography and siting of the home on the property. Information included in this publication is focused on the home and is intended to provide information to help you make “fire wise” decisions regarding material choices and design decisions, whether you are building a new home or retrofitting your existing house. A considerable amount of information has been published in recent years on defensible space and vegetation management. Check with your local cooperative extension office or fire department for information appropriate to your area. Hundreds of fires are started each year by power tools. If you live in a wildland area, use extreme caution during fire season. Lawn mowers, string trimmers, chain saws, grinders, welders, and tractors can all start fires if not used properly. Mowing: Striking rocks can create sparks and start fireas in dry grass. Use caution, mow only early in the day (before 10AM, when the weather is calm, cool, and moist). Spark Arresters: In wildland areas, spark arresters are required on all portable, gasoline-powered equipment. This includes tractors, harvesters, chainsaws, weed-trimmers and mowers. Keep the exhaust system, spark arresters and mower in proper working order and free of carbon buildup. Use the recommended grade of fuel, and don’t top it off. Visit www.firesafesanmateo.org for more information on creating defensible space! From earthquakes and hurricanes to flooding and rising sea levels, natural disasters can strike anywhere and at any time. No region of the country is immune from the impacts and rising costs of disaster damage. In light of this stark reality, the National Building Museum presents a multimedia exhibition titled Designing for Disaster, a call-to-action for citizen preparedness—from design professionals and local decision-makers to homeowners and school kids. The exhibition explores strategies local leaders are currently pursuing to reduce their risks and build more disaster-resilient communities. The exhibition will open May 11, 2014 and remain on view through August 2, 2015. Natural disasters can impact any of us, anywhere, at any time. In 2012, the financial toll in the United States alone exceeded $100 billion, and the loss of life and emotional toll is immeasurable. No region of the country is immune—112 events in 32 states were declared natural disasters in the U.S. during 2012. The One Less Spark, One Less Wildfire Weather Forecaster Toolkit with fire weather reporting ideas for all media is available and ready for use. Links to websites to further enhance wildland fire weather information. Sponsors include: California Wildfire Coordinating Group Prevention Subcommittee. Member agencies of the CWCG include; US Forest Service, CAL FIRE, US Fish and Wildlife Service, Bureau of Indian Affairs, Cal OES, Caltrans, CAL Fire Safe Councils, Bureau of Land Management and National Park Service . The Toolkit is attached and can also be downloaded from: http:/www.preventwildfireca.org/OneLessSpark/. Please give us feedback about your thoughts and use of the Toolkit. Appropriate manipulation of the landscape can make a significant contribution towards wildfire survival. Firescaping integrates traditional landscape functions and needs into a design that reduces the threat from wildfire. In addition to meeting a homeowner’s aesthetic desires and functional needs, firescaping includes vegetation modification techniques, planting for fire safety, defensible space principles, and use of fire safety zones. Three factors determine wildfire intensity: topography, weather and fuels (vegetation). Property owners can control the fuel component through proper selection, placement, and maintenance of vegetation. 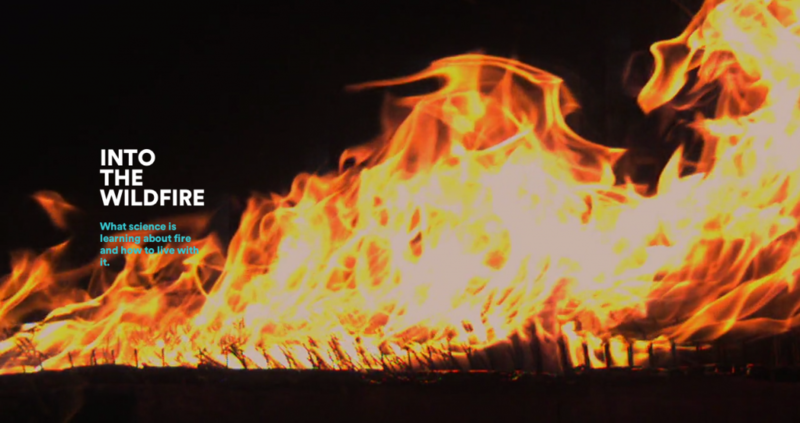 Careful planning and firescape design can diminish the possibility of ignition, lower fire intensity, and reduce how quickly a fire spreads – all factors which will increase a home’s survivability during a wildfire. In firescaping, plant selection is primarily determined by a plant’s ability to reduce the wildfire threat. Other considerations may be important such as appearance, ability to hold the soil in place, and wildlife habitat value. Minimize use of evergreen shrubs and trees within 30 feet of a structure, because junipers, other conifers, and broadleaf evergreens contain oils, resins, and waxes that make these plants burn with great intensity. Choose “fire smart” plants - typically plants with a high moisture content, larger leaves, low growing, with stems and leaves that are not resinous, oily or waxy. Deciduous trees are generally more fire resistant than evergreens because they have a higher moisture content when in leaf, and a lower fuel volume when dormant. Placement and maintenance of trees and shrubs is as important as actual plant selection. When planning tree placement remember their size at maturity. Keep tree limbs at least 10 feet from chimneys, power lines and structures, and separate canopies so no trees touch. Do not plant shrubs beneath trees. Firescape design uses driveways, lawns, walkways, patios, parking areas, areas with inorganic mulches, and fences constructed of nonflammable materials such as rock, brick, or concrete to reduce fuel loads and create fuel breaks. Fuel breaks are a vital component in firescape design. While bare ground can not burn, it is not promoted as a firescape element due to aesthetic and soil erosion concerns. When designing a firesafe landscape, remember that less is better. Simplify visual lines and groupings. A firesafe landscape lets plants and garden elements reveal their innate beauty by leaving space between plants and groups of plants. In firescaping, open spaces are as important as the plants. A recent conference in Glenwood Springs, Colorado explored The True Cost of Wildfire. Usually the costs we hear associated with wildfires are what firefighters run up during the suppression phase. The National Incident Management Situation Report provides those numbers daily for most ongoing large fires. But other costs may be many times the cost of suppression, including the value of structures burned, crops and pastures ruined, economic losses from decreased tourism, medical treatment for the effects of smoke, salaries of law enforcement and highway maintenance personnel, counseling for victims, costs incurred by evacuees, infrastructure damage and shutdowns, rehabilitation of watersheds, forests, flood and debris flow prevention, and repairing damage to reservoirs filled with silt. And of course there can not be a value placed on the lives that are lost in wildfires. In Colorado alone, fires since 2000 have killed 8 residents and 12 firefighters. [Fire ecologist Robert] Gray said the 2000 Cerro Grande Fire in New Mexico ended up having a total estimated cost of $906 million, of which suppression accounted for only 3 percent.Creede Mayor Eric Grossman said the [West Fork Complex] in the vicinity of that town last summer didn’t damage one structure other than a pumphouse. But the damage to its tourism-based economy was immense.“We’re a three-, four-month (seasonal tourism) economy and once that fire started everybody left, and rightfully so, but the problem was they didn’t come back,” he said. A lot of the consequences can play out over years or even decades, Gray said.He cited a damaging wildfire in Slave Lake, in Alberta, Canada, where post-traumatic stress disorder in children didn’t surface until a year afterward. Yet thanks to the damage to homes from the fire there were fewer medical professionals still available in the town to treat them.“You’re dealing with a grieving process” in the case of landowners who have lost homes, said Carol Ekarius, who as executive director of the Coalition for the Upper South Platte has dealt with watershed and other issues in the wake of the 2002 Hayman Fire and other Front Range fires. The Hayman Fire was well over 100,000 acres in size and Ekarius has estimated its total costs at more than $2,000 an acre. That’s partly due to denuded slopes that were vulnerable to flooding, led to silt getting in reservoirs and required rehabilitation work.“With big fires always come big floods and big debris flows,” Ekarius said.Gray said measures such as mitigating fire danger through more forest thinning can reduce the risks. The 2013 Rim Fire in California caused $1.8 billion in environmental and property damage, or $7,800 an acre, he said.“We can do an awful lot of treatment at $7,800 an acre and actually save money,” he said.Bill Hahnenberg, who has served as incident commander on several fires, said many destructive fires are human-caused because humans live in the wildland-urban interface.“That’s why I think we should maybe pay more attention to fire prevention,” he said. Just how large the potential consequences of fire can be was demonstrated in Glenwood Springs’ Coal Seam Fire. In that case the incident commander was close to evacuating the entire town, Hahnenberg said. “How would that play (out)?” he said. “I’m not just picking on Glenwood, it’s a question for many communities. How would you do that?” He suggested it’s a scenario communities would do well to prepare for in advance. 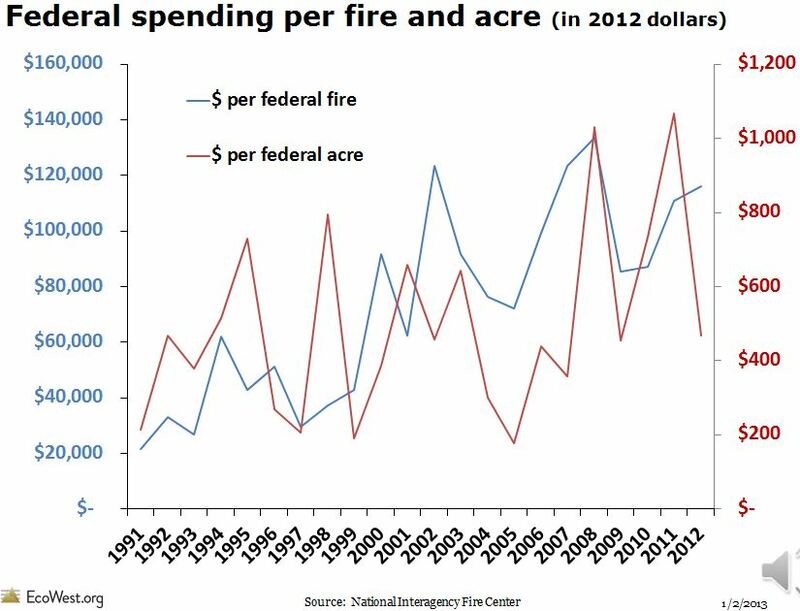 The chart below from EcoWest.org shows that federal spending per wildfire has exceeded $100,000 on an annual basis several times since 2002. Since 2008 the cost per acre has varied between $500 and $1,000. These numbers do not include most of the other associated costs we listed above. CAL FIRE is asking homeowners to prepare earlier in creating Defensible Space due to California's current drought conditions. Never mow or trim dry grass on a Red Flag Warning Day. (Mow before 10 a.m. on a day when it’s not hot and windy). For more fire prevention tips visit www.firesafesanmateo.org or www.PreventWildfireCA.org. Recent wildfire events throughout the world have highlighted the consequences of residential development in the wildland-urban interface (WUI) including hundreds to thousands of homes burned during a single wildfire to, more tragically, firefighter and homeowner fatalities. Despite substantial investments in modifying wildland fuels near populated areas, losses appear to be increasing. In this article, US Forest Service Researchers examine the conditions under which WUI wildfire disasters occur and introduce a wildfire risk assessment framework. By using this framework, the authors examine how prefire mitigation activities failed to prevent significant structure loss during the Fourmile Canyon fire outside Boulder, CO. In light of these results, the authors suggest the need to reevaluate and restructure wildfire mitigation programs aimed at reducing residential losses from wildfire. (Calkin etal, 2013 p 5-6). Tthe MidPeninsula Regional Open Space District Board of Directors approved a new 40-year Vision Plan January 29, 2014. Among the Vision Plan's priorities are Fire Management, Fire Risk Reduction, and Fire Risk Reduction on open space properties in San Mateo County. The Vision Plan includes a slate of 25 tier-one regional open space projects ranging from opening preserves and building trail connections to improving water quality, protecting the coastline, restoring forestlands, and creating wildlife corridors in an increasingly urbanized region. A complete list of the approved Vision Plan Priority Actions can be found at www.openspace.org/imagine. Fire Safe San Mateo County is proud of its strong working relationship with "MidPen" and looks forward to a continued partership in reducing the risk of wildfire on MidPen lands and the adjacent San Mateo County communities. Today the California Fire Safe Council announced grants for 38 projects spanning 30 counties in California and Nevada that support CFSC’s efforts to support fire risk reduction activities by landowners and residents in at-risk communities. CFSC received 84 applications, and awarded 38 grants. California Fire Safe Council (CFSC) is pleased to announce its 2014 Grants Clearinghouse Awards. Executive Director Margaret Grayson announced grants for 38 projects spanning 30 counties in California that support CFSC’s efforts to support fire risk reduction activities by landowners and residents in at-risk communities in California and Nevada. The decisions that have been made are preliminary funding decisions at this time based on funding and the next steps in the Clearinghouse. CFSC received 84 applications totaling $8 million in grant requests and over $10 million in matching dollars. The projects are being funded by grants from the Cooperative Fire Program of the U.S. Forest Service, Department of Agriculture, Pacific Southwest Region, through the California Fire Safe Council. With the change in seasons, fall is an excellent time to focus “inward” on the areas closest to your home, according to the latest issue of the Firewise “How-To” Newsletter. In the Home Ignition Zone (HIZ), debris can accumulate creating a greater risk in the event that embers or flames come near. While the Home Ignition Zone typically includes property within 150 feet of your home, concentrating on the areas closest to your home – 0 to 5 feet from structures – can make a tremendous difference when it comes to preventing the risk of fire. For more safety tips and to read the full story, check out the Fall 2013 issue of the Firewise “How-To” Newsletter. They are called grass fires, forest fires, wildland fires, or by a variety of names. Yet, no matter the name, they pose an evolving threat to lives and property in an increasing number of communities across the United States. Homes near natural areas, the wildland/urban interface (WUI), are beautiful places to live. These pristine environments add to the quality of life of residents and are valued by community leaders seeking to develop new areas of opportunity and local tax revenue, but these areas are not without risk. Fires are a part of the natural ecology, living adjacent to the wilderness means living with a constant threat of fires. Fire, by nature, is an unpredictable and often uncontrollable force. The concept of fire-adapted communities (FACs) holds that, with proper community-wide preparation, human populations and infrastructure can withstand the devastating effects of a wildland fire, reducing loss of life and property. This goal depends on strong and collaborative partnerships between agencies and the public at the State, Federal, and local levels, with each accepting responsibility for their part. Your Role in Fire-Adapted Communities frames the FAC concept and current efforts to define its scope, explain the roles that groups can adopt to improve their fire safety, and provide guidance on future steps. The U.S. Fire Administration (USFA) believes that by reviewing the roles and responsibilities each group can adopt now, communities will become better prepared to realize the FAC goal in the future. Download the U.S. Fire Administration "Your Role in Fire-Adapted Communities" Handbook. As part of its commitment to enhancing public safety, NFPA makes its codes and standards available online to the public for free. Online access to NFPA's consensus documents conveniently places important safety information on the desktops of traditional users as well as others who have a keen interest. NFPA is committed to serving the public's increasing interest in technical information, and online access to these key codes is a valuable resource. View the full list of NFPA's codes and standards. Select the document you want to review. Select the edition of the document you want to review. You will be asked to "sign-in" or create a profile to access the document in read-only format. NY Times: INTO THE WILDFIRE - What science is learning about fire and how to live with it. ...We probably wouldn’t be as concerned about fires that are getting bigger and spreading farther, of course, were it not for the increasing intrusion of people and buildings into fire-prone landscapes. This development creates what fire experts call the wild-land-urban interface, or WUI (pronounced WOO-ee), and from Bozeman, Mont., to Laurel Canyon in California, more and more of us want to live there, with forested views and coyotes for neighbors — but without the fire. About 80,000 wildfires in the United States were designated for suppression each year between 1998 and 2007, and only an average of 327 were allowed to burn. Yet trying to put out all those fires leads inevitably to more intense, more dangerous and more expensive fires later on. The accumulation of dead wood and unburned “ladder fuels” — what ecologists call lower vegetation that can carry fire to taller trees — turn lower-intensity fires into hotter fires that kill entire stands of trees that otherwise might survive. Read more of this excellent article in the New York Times Magazine September 22, 2013 Online. Destructive wildfires are affecting many areas across California, threatening communities, risking the lives of firefighters, disrupting residents through evacuations and home losses, and creating millions of dollars of damage to homes, businesses and valuable natural resources. The good news is, there are simple and often inexpensive ways to make homes safer from wildfire. With an understanding of wildfire hazards and mitigation strategies, community residents can effectively lower the wildfire risk and losses to their homes, neighborhoods and our environment. The Sacramento (California) Metropolitan Fire Department has received a FEMA grant to complete Community Wildfire Protection Plans (CWPPs) and as a part of that effort is offering the National Fire Protection Association’s (NFPA) one-day “Assessing Residential Wildfire Hazards” and two-day “Assessing Wildfire Hazards in the Home Ignition Zone”mitigation training to fire service professionals, stakeholders, proactive community residents and others interested in understanding and acting to reduce wildfire losses. These national courses are taught by experienced wildland fire specialists and offer factual wildfire mitigation solutions and action strategies based on research and post fire investigations. Participants will learn the mitigation techniques that are most effective in reducing wildfire losses in the home ignition zone (HIZ) – the home and the surrounding 100 to 200 feet. The courses will also focus on both the physical and behavioral sciences in completing successful wildfire mitigation. Register today for workshops beginning October 1. For more information and to find the nearest workshop location, visithttp://metrofirecwpp.eventbrite.com/. Power Lines and Fire: NPS "Fire and Fuel News"
Fortunately, these fires did not start under extreme weather conditions and were quickly suppressed. A Power Line Fire Prevention Field Guide has been developed for California which includes the public resource code requirements designed to prevent power line fires. The introduction sets the stage for understanding how high winds, in combination with power lines have led to some of California's largest wildfires. Read more about power lines and wildfires in the National Park Service's July 2013 "Fire and Fuel News." The summer season means more than school vacations and weekends at the pool. Summer brings an increase in the threat of wildfires and the danger that these outbreaks carry. As firefighters worked to contain wildfires across California, the National Interagency Fire Center recently published its summer fire outlook that forecasts a difficult, above average wildfire season in the West. Wildfires spread quickly and often go undetected until it’s too late. Across our nation every year communities are affected by major wildfires. While some homes survive, more homes do not. Make sure your family and community take actions to get prepared. The wildfire tips at Ready.gov reference the NFPA Firewise program and other excellent resources to help you prepare your home and know what to do before, during and after a fire event. A report on why wildfires are becoming more severe and expensive, and how the protection of homes in the Wildland-Urban Interface has added to these costs. The potential for new home development in the wildland-urban interface (WUI) at the county and state level. State-specific research on the impact of new homes and temperature change on wildfire suppression costs. White Paper with suggestions for how future firefighting costs best can be controlled.